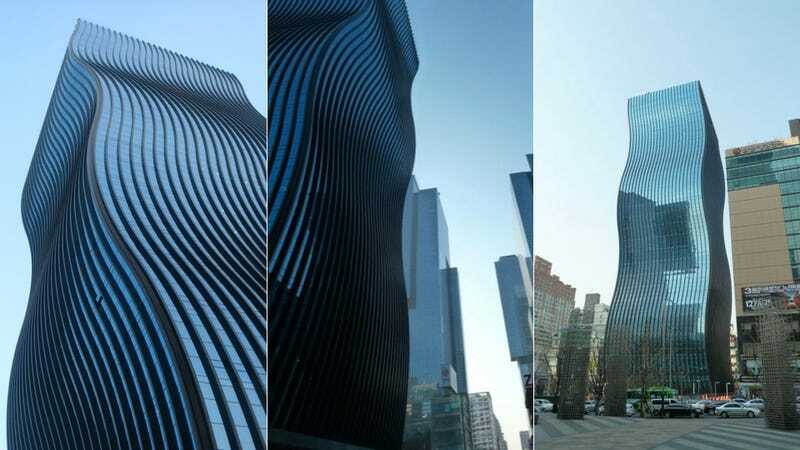 When I first saw it I thought this stunning skyscraper in Seoul was so awesome that it had to be an April Fools prank. It's not. It's the GT Tower East, a 130-meter (426.5-foot) high building that was completed in February 2011. Totaling 54,000 square meters of floor space, the GT Tower was designed by dutch architects Peter Couwenbergh and Edgar Bosman of ArchitectenConsort—probably while sniffing airplane fuel and drinking turpentine—in July 2008. Take a look at the gallery. It's like someone got a frame from Inception and made it out of glass and steel. The designers spend a lot of time thinking how to achieve the effect in real time. According to the company, "the motion effect of the volume has been achieved by shifting the floor areas along one of the two diagonals by a maximum of three metres. This shift occurs two-and-a-half times over the total height of the building, so that each wave has a height of 48 metres." That's 157 foot of pure awesomeness, twice. The advantage of this design is that the columns are placed right above each other and the cantilever can be achieved just with extra reinforcing within the same floor dimensioning. In addition, the facade construction could be completed without any fittings, because all facades move in parallel. So as not to break up the vertical lines of the facade by interrupting horizontal segmentation, the architects compressed the ceilings towards the outer facade to the size of a window frame. Using this method, the installation of closed or opaque glass panels behind the facade is avoided, which benefits both the interior as well as the exterior appearance. The pattern and dimensioning chosen for the black vertical window frames ensures a subtle balance with the semi-reflective blue glass panels. The window frames also accentuate the form, emphasizing the infinite upward movement.